Many thanks to everyone who contributed to the Kickstarter for Eclipse Phase, Second Edition! 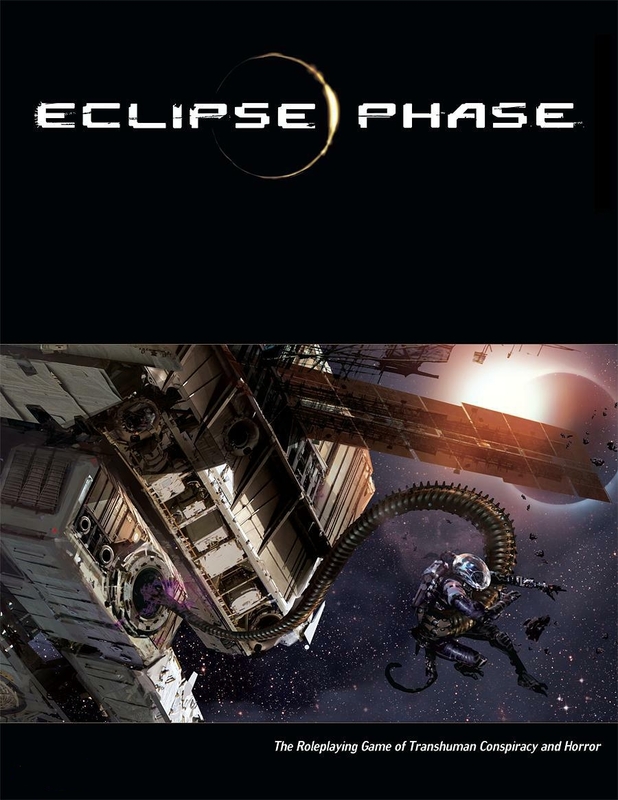 The Eclipse Phase roleplaying game is released under a Creative Commons license. To facilitate access to the PDFs, I am providing a complete set of links to the current updated version of each on this page. While we encourage you to share these PDFs with friends and strangers, we also encourage you to support our work and purchase them if you want to see the game thrive! I just discovered your amazing game. the possibilities of transhumanism have long exerted a tight hold on my imagination. Currently, my sci-fi longings are satisfied by Shadowrun. However, I am reading through the PDFs, and I am getting ready to buy the Eclipse Phase book from Amazon. I used to work in advertising and marketing, and I have to compliment you on your brilliant approach: offering free copies of the full-color PDFs; simply brilliant! after looking at the pdf of several books I went and bought books for the entire line to date. even killed a few trees for my friends to have copies bought through amazon. many copies of pdf I bought from drive through as well. I want to see more of this game. Bloody fantastic. 6 weeks in and my group is loving it. We all are the Post demand loving transhumanist types and they are all hooked. Had the main book for a year now, and now ordering the rest one a month almost… It’s too good not to have the full set. Thanks for sharing your work with us. Hope I can use it with my group. I’ve bought the pdf and the dead tree version. Thanks for the free way to get the updated material. Ive enjoyed all the work that everyone had done so far. Kudos for you brave and intelligent approach to marketing Eclipse Phase! I am a librarian which in today’s world probably makes me a socialist. But I am a strong believer that sales will go up if you offer free electronic versions of books, just as sales of books and other materials will go up if copies of those items are available in libraries. I have tried making that point for the past ten years with Wizards, but they just don’t agree. My gaming group has been playing regularly together for well over 30 years. In that time we have played a dozen different role playing games. I think we might have just found our new game to play. Bought the book from amazon today. Thanks guys. I really support this approach to publishing intellectual creations. Eclipse Phase is really a great game and I can’t wait to gather a group for test-play. I will also buy hard-copy version. First because I really enjoy holding physical book in my hands (and Eclipse Phase is decidedly a beauty), and second to support you good people. Great book – and one of the most interesting sci-fi universes. I just wanted to thank you for the pdfs. I’ve been looking for a new game, and the lovely people of reddit turned me onto yours. I’ve only read the wikipedia write-up and the opening narrative so far, yet I’m already hooked! It’s powerful writing. I’ll surely be getting a shiny, new hard copy this week. Thanks again! Thank you for providing these materials. $50 is a hefty chunk of change for me and I probably wouldn’t have taken a chance on this game without being able to see the book first. I’ll definitely be picking up a hardcopy now. Rob, even though I don’t like very much percentual systems, I have to say your work is just awesome. I simply love EP setting, ideas, mood and specially the plot oportunities it gives. The free sharing approuch you and your team choose for the distribution is just one of the many dimensions that make EP great, and paradoxically, the main reason why I bought the core, gatecrashing and sunward, and expect to keep buying further EP paper expansions you people create. Just keep the incredible work, so I have more opportunities to give you all the rep I can. Imagination is free: Share it! Thanks a lot, i’d wish great corporations had the new market possibilities understanding you have, their enemies are not pdf’s nor free distribution of multimedia files, their enemies are the lack of intelligence and mediocrity. Because of this post, I’ve been able to easily introduce the game to a bunch of my friends, a number of which will likely be purchasing copies of their own. I’ve made a point of buying both the PDF and the hardcopy of every book I’ve made use of thus far. I really want to see you guys thrive for setting such a stellar example of how to do things /right/. 1. If this game released under Creative Commons licence, may I translate some parts of it to russian language and release results in open access? 2. Do you think about turn Eclipse Phase to mmorpg? @kuein — 1) Yes, you can translate and release it for free under the same license. If you do so — please let us know! 2) Would love to, but it’s a challenge to get any video game studios to consider licensing a property. Thanks for the share. I’m from Spain and I ordered a printed copy of the game. Great for free sharing. Thanks. Thanks for hosting these files. I want to look over it and try a one-shot to see if my group likes it. Looks fun. I downloaded the core book and loved it so much that I bought the dead tree version. I love your work, and hope that life treats you well. Rob- Thank you for making these freely available! I’ve already bought (and love!) the core rules in hardcopy, and plan to buy some of the sourcebooks in hardcopy as well. But your willingness to make them all available online is a strong selling point in getting a campaign together with my players. Rob- one followup question: What’s the best way to support your work by buying these products? Is it more beneficial to you if we buy a hardcopy book from our local game store ($50) vs. hardcopy on Amazon ($35) vs. a PDF on DrivethruRPG ($15)? Thanks for the brilliant work and the visionary distribution method. I’ve bought the PDF from DTRPG, and two copies of the dead-tree version. The third printing looks great, by the way (it seems thicker than earlier printings, too). The bookmark ribbons were a nice touch! You have an outstanding game on your hands and I will be buying the hardcopies the next time I make a trip to my local gaming store. Your approach to marketing is as lean and cutting-edge as a hypercorp. @Chaz — You can find character sheets here: http://eclipsephase.com/resources — specifically, check out the fan creations. Thank you and the rest of the EP team for making such an interesting product and for your forward thinking approach to marketing. Too many companies treat the customers like enemies or parasites, but such activities are doomed to fail. A great business practice and a great customer. You and yours have found both a fan and a loyal customer. Eclipse phase has to be one of the best RPGs I have ever seen and, indeed, played! Rob,I believe I have bought paper versions of everthing, I appreciate being able to ave easy access to the electronic verson. I know I downoaed Panopticon, but there is no active link for it now. Will there be one? Thank for a great game. After having read the PDFs I’m now a happy owner of a dead tree version of the main book and plan on buying the rest. Make sure to up he RPPRs crew rep. They were the gateway drug to your game for me. @Anders — the link above for Panopticon works. I don’t have a magnet torrent link as I haven’t gotten around to it yet, but I will do that soon. Thank you so much! We bought a copy of the book, but the binding is kind of falling apart so I’m glad we have an online version that won’t deteriorate. 🙂 We love the Eclipse Phase world! I can’t use torrent here and I’ve been trying to download the inner system pdf direct. It seems to stall a tenth of the way in? I just recently switched from D20 modern, to EP. And I have to say, I am in love with it. The fact that you put your books out there for people to use, even if they don’t have the money to buy them, is amazing. Even more so with the current economic problems so many people are facing. As soon as I’m able, I will be requesting my local game store to order these books, so that I may purchase them. Thank you for providing a wonderful game, that will provide countless evenings of entertainment. Bought the dead tree version at my favourite game store. Just downloaded the free version to print out “player’s guides” for the game I’m starting in a week. Thanks for making this available to us poor folks! I downloaded the core book here and loved it. Next day, I went out and bought a hard copy, cause you guys are awesome and deserve every cent. I downloaded the .PDF for the main rules a couple of days ago. Started reading it on my iPad, got as far as page 72, and I’ve just weakened and ordered the dead tree version from Amazon. Thank-you for trusting your readers. The setting is wonderful. And by the way, the illustrations are stunning. Thank you for the PDFs. I bought the hard copy and loved it. Wanted to put it on my ipad and went looking for some pdfs and found these! I’m so happy developers like you realize the usefulness of using pdfs. Thanks again! This is amazing. I admit I donwloaded the corebook from some site on the Internet before learning they were available here. As it is, I really dislike reading PDFs and this game line is so good (and good-looking) that I ordered several books in hardcopy format. Keep up the great work. This gift has convinced me that I should buy some more Eclipse Phase hardcopies. I’ve been looking into getting EP for a while now, but I was waiting until I was finished with our groups current game (Mechwarrior). Found this site looking for the quick start rules and come to find they full rules are up for free, plus tons of other content! You can be sure I will be supporting EP, if only for the fact that you guys offer it for free like this. Easily the coolest RPG setting. I have a hard copy of Core rules and Panopticon. Thanks for releasing the rules in the open, it’s allowed me to get a game together and give my players the pdf rules. I’m looking forward to when I can afford to buy Sunward and Rimward hard copy. You guys are a major inspiration for me as I make my own game. The sheer flexibility possible for characters you have created is incredible. Good luck for whatever you choose to do in the future. Bought my copy LONG before I ever knew these were available. Your team and your work are truly a masterpiece to behold. I plan on offering a few copies of the PDF as Christmas gifts. Wow! thank you so much! I saw this on rpggeek.com and on Twitter and I couldn’t just believe it! Thank you so much. I hope I’ll like this game and therefore buy the printed books if I do. by far, one of my favorite sf game!!! I absolutely rave about this game, and it is one of the best out there (if not THE best). The support by the Company and the fans is just excellent (a few other companies could learn from your example). The system is damn near perfect. I could go on, but I’m not, it would become far too gushy! All I will say is, if you haven’t tried it, give it a go, I promise you won’t regret it. I just wanted to say that this game looks really great and its certainly something for you guys to be proud of.I’ll be buying a hard copy ASAP. This is absolutely one of the best RPGs I have seen. I will be buying the dead tree hard-copy in the near future. I downloaded and reviewed some of the material in the core-book and I am enthralled with it. I plan to grab as many sourcebooks also as I can also. Keep up the great work at whatever you do. I downloaded the PDF and spent several hours reading through the background and system. I’ve been playing Blue Planet now for better than a decade and this game is the most impressive science fiction game I’ve seen in a looooong time. It is a bold step into the genera of transhumanism and I like the simplicity of the system that supports it. I like your method of marketing as reading the PDF convinced me to buy a hardcopy. While PDFs are nice, I prefer to have a printed copy in my hands both for ease of reading and reference during play. Well done. It’s wonderful that these are online. I can form a group much faster than otherwise by getting everyone up to speed very quickly. I love the game and have all the hardcopy versions. I thank you for providing good pdf versions I can also keep and read on my iPad. They will never replace my hardcopies I cherish but they are great to read in other situations where carrying the books might be prohibitive. You open source apes at Posthuman are the light of my life! I can’t believe forward thinking excellence like yours even exists in our capitalist hellworld. You are beautiful, wondrous people. You guys keep being awesome! Bought most of your stuff as dead trees, never regretted it. I’ve got the book in hard copy but having these available as pdf like this is great for at work where I can’t lug around a bunch of books. A great big thanks to you! So, when’s the Firewall PDF going to drop? I’d love to help the first-pass error hunt, but I don’t have like, any dollars to my name at present. Got the core and all the supplements in HB. The game is absolutely amazing! Top spot on my list along with Numenera. Will you be updating this with Firewall sometime soon? Firewall, Million Year Echo, and Zone Stalkers added. I’ve bought the adventure years ago, so I don’t really mind much, but “Continuity” is giving a 404 to me. What a awesome RPG and a fantastic theme: the solar system. Game shop near my home still had 4 source books (Core rules, Sunward, Rimward and Firewall) in hard prints. After looking at the quality of the books, I bought them all. Question: Do you have a scenario that can be played alone? I just want to start a game to know better the rules before gather my people that play mostly fantasy RPG. Also, bravo on your licensing model. Thanks for making these available. I prefer hardcover books and have bought every single one of them. I have 8 in total. Awesome art, great writing, excellent imagination, science, and vision for the future. Thanks for letting me download these so I can read them on my iPad when I am travelling and can’t bring all 8 volumes with me! I was looking for a SF RPG to play again within a group and I found EP. I am so delighted with the huge hard SF background that I immediately shunt my searches!! Eclipse Phase is now MY game!! As my bank account is not flourishing very well, I will buy a book per month in its hardback (for better reading sessions and to prepare my scenarios) AND in its digital format (for my iPad when I play with my group – much lighter than the whole HB collection!!). Thank you so much to offer such wonderful RPG set online!!! Just bought the main book from Amazon UK. These will give me a good idea of what to buy next… Awesome stuff. All of your GenCon games sold out instantly. I was trying to get my regular GM to sit in on an event. Yeah that happens every year. We added a bunch of additional games this year, but demand is high. We’re always on the lookout for GMs to run games for us at Gen Con — we pay! Drop us an email at info at posthumanstudios dot com. It is now available. Thank you Rob for keeping up the good work. The X-Risks book is what I have been waiting for since Transhuman book. Just ordered the physical book. Now I can easily make characters and not kill them by accident. Give this to me straight, Where do I buy these where you get the most money? My group is having a dispute on a certain ruling, and seeing you are a co-creator of the game, I was wondering. What is the ruling on called shots and armor. The DM ruled that the total armor rating goes to the affected area while a player argues that the called shot should only have armor based on the affected area. The situation is that the player made a called shot for the head and made 44 damage with -2 armor piercing. The morph had 35 durability and 12 total armor but only has around 2 armor for a helmet. How would you handle the situation? FYI, you can send rules Qs to info at posthumanstudios dot com. I would apply the armor for that specific location — that’s part of the benefit of doing a called shot. Just to join the chorus of commendations for your wise marketing decision – there are so many rpg systems out there, and I won’t buy before I try. If I manage to get a game running (depending mostly on whether I can wrap my head around the concepts!) I’ll definitely buy a copy. Just a few words to thank you for your job .. Eclipse Phase is a very good game !! I’m gamemastering this game with pleasure for more than one year ! We love you, Rob! Thank you for your generosity in sharing these files with us! I was so happy to back the Kickstarter for Transhuman. This has become my favorite RPG! Offering this for free is so incredibly nice, I’m literally crying a little. Just love the setting! Will finally get to play it, this autumn. There’s so much to do, explore, experience in this game. The PDFs are extremely handy – browsing them in the first place not only made me go out and buy the whole line of books (I prefer the printed version, but use the PDFs for quick reference – and to lure in new players), but also to preorder the next edition of the core rules at my local games store. Great initiative! Credit belongs to Posthuman Studios and Dr. CM Wong/Opus Artz for this piece, which appears in the Eclipse Phase RPG core rulebook. Some rights reserved.